I’m not afraid to admit that I love pasta salad. Any way you make it, I’ll eat it. Now that summer is finally here I’ve been whipping up all sorts of salads… mainly because they’re easy and we can enjoy the leftovers for days, but also because it means I don’t have to turn the oven on! 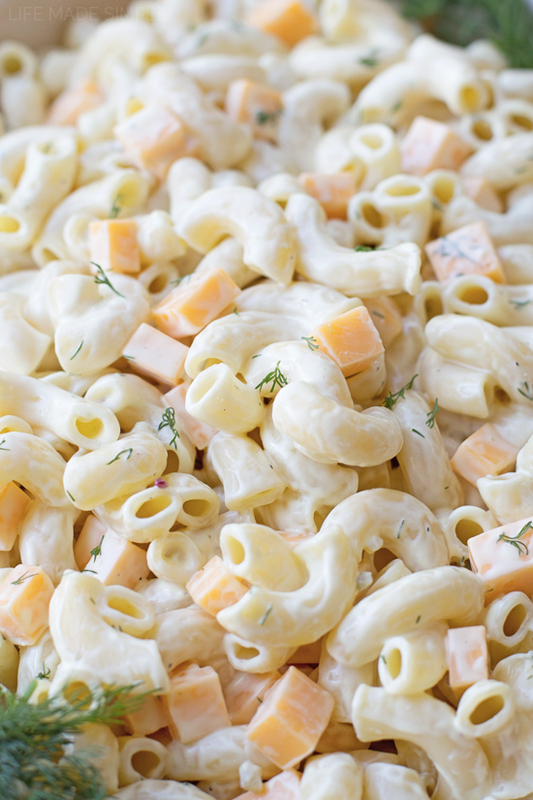 This macaroni salad is one of my new favorites- it’s creamy, tangy and loaded with fresh dill and chunks of cheddar cheese. You know the kind of macaroni salad you get at a good deli? Yep, this is exactly like that. And it’s crazy easy to make! Like I could do it blind folded if I needed to. All you need is a handful of simple ingredients and just 30 minutes! To start you’ll want to boil the macaroni. I like to use large elbows, but smaller ones will work too… or even ditalini! Really the shape doesn’t matter, I just like something that will hold in a little bit of the creamy sauce. While the pasta is cooking, in a large mixing bowl whisk together some mayo, half and half, yellow mustard, dill pickle juice (trust me on this one), sweet relish, minced dill and a bit of salt and pepper. Just so you know, you can play around with the fat content of the mayo and half and half. Sometimes I even sub part of the mayo (I use light) with a bit of plain Greek yogurt. The tanginess works perfectly! Once the noodles are al dente, drain them, rinse them in cold water and toss them in olive oil. The olive oil will help coat the pasta and will prevent it from drying out over time. If you plan on serving/eating all of the macaroni salad the same day you make it, you can omit the olive oil or reduce it by half. 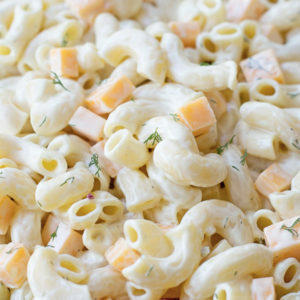 Mix the cold pasta together with the sauce, toss in the cheddar and it’s ready to go! I like to chill mine for at least an hour, but usually 2. 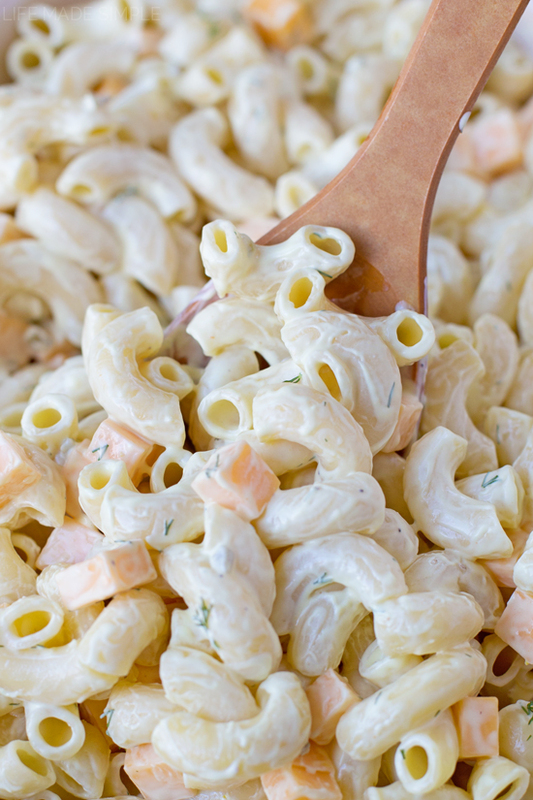 You’ll be surprised by how quickly this macaroni salad gets gobbled up! 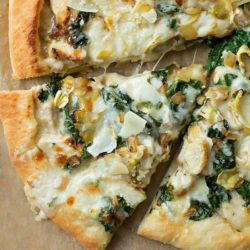 It’s creamy, flavorful and absolutely perfect for summer! 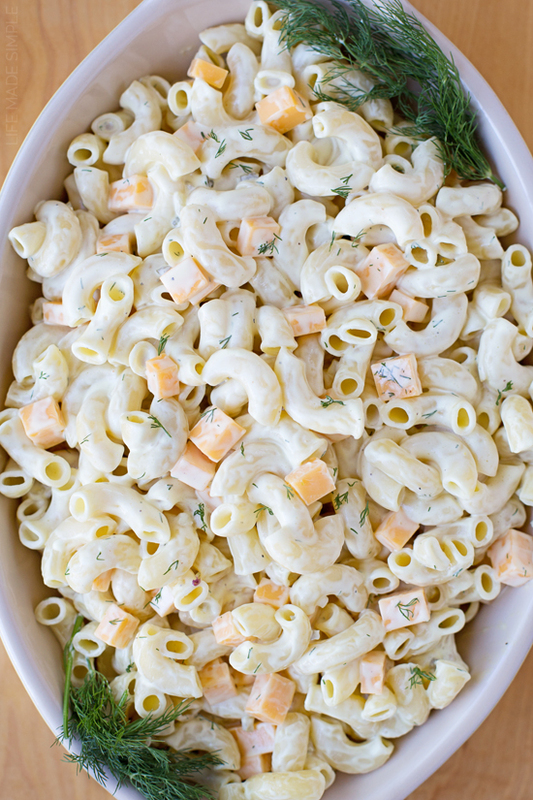 This deli-style creamy cheddar and dill macaroni salad is perfect for summer! It's easy to make and can serve a crowd! Bring a large pot full of water set over high heat to a boil. 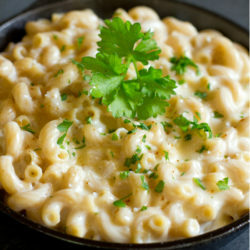 Cook macaroni according to the package's instructions, drain and rinse with cold water. Toss the noodles with a tablespoon of olive oil. While the pasta is cooking, in a large mixing bowl whisk together the mayo, half & half, mustard, pickle juice, relish, dill, salt and pepper. Pour the cold pasta (that has been tossed in the olive oil) into the bowl and add the cubed cheese. Stir with a spatula to combine. The mixture may be a bit runny, but as it chills it will soak up the moisture. Cover and place in the refrigerator for at least 1 hour. *You can sub out half of the mayo for plain Greek yogurt. It will be slightly more tangy but I think it goes nicely with the dill/mustard/cheddar combo. Ah, this is one of my all-time favorite pasta recipes! Thank you so very much for sharing this! We did not care for this dish even though all the ingredients are ones we use. Made this tonight. It was wonderful! I added onion and green pepper though and left out the mustard! 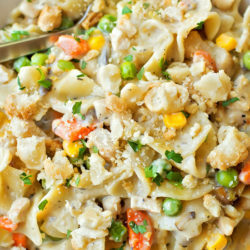 This is one of my absolute favorite summer dishes! It’s the perfect amount of creamy and tangy.